Beirut (AP) — Lebanese authorities in Beirut are interrogating a man suspected in the death of a Filipina maid whose body was found stuffed in a freezer in Kuwait, security and judicial officials said Saturday. 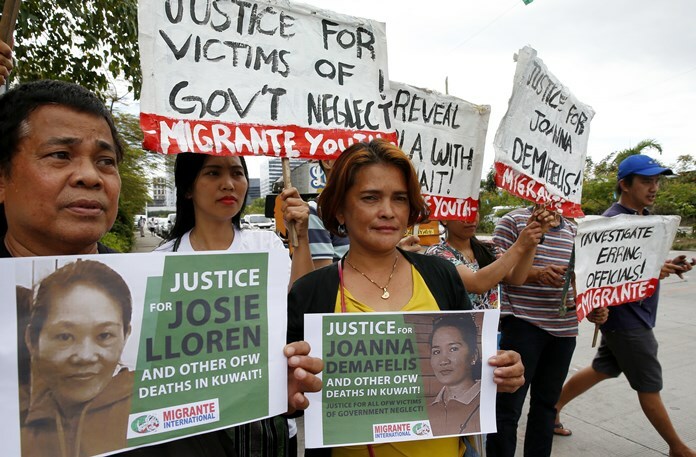 The Feb. 6 discovery of Joanna Demafelis’s body in the apartment in Kuwait City, where it had reportedly been kept for more than a year, sparked outrage and refocused attention on the tragic plight of poor Filipinas toiling mostly as maids abroad. It prompted President Rodrigo Duterte to ban the deployment of new Filipino workers to Kuwait, where many abuses have been reported. A senior official with Lebanon’s General Security Directorate refused to provide details other than that the man is being held by the agency and undergoing questioning. A judicial official said Saturday Lebanese citizen Nader Essam Assaf was handed over by Syrian authorities to Lebanon Friday. He added that the man’s Syrian wife is in Syria. The judicial official added that it appears that when Assaf felt that the case might be discovered in Kuwait, he fled to Syria along with his wife hoping that he would not be detained. Syrian authorities detained him and later handed him over to Lebanon as he is a Lebanese citizen, the official said. Both officials spoke on condition of anonymity because they were not authorized to brief reporters. Lebanese media outlets reported that Assaf is from the northeastern region of Baalbek but he grew up in a neighborhood south of Beirut. Assaf and his wife are suspects in Demafelis’ death. On Friday, the Philippines’ foreign secretary said that the suspect is under arrest in Lebanon.